The recent report from the SEC and the Commodity Futures Trading Commission on the Flash Crash fingers an automatic sell program executed by a “Mutual Fund Complex” as the trigger of the crash. 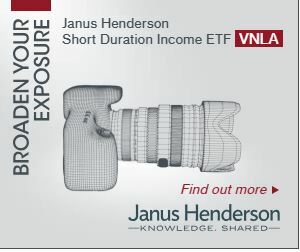 Starting at 2:32 p.m. EDT on the 6th of May this program, referred to as the “Sell Algorithm” automatically sold short 75,000 E-Mini S&P futures contracts (approx 4.1 Billion dollars worth, equivalent to about 42 million shares of SPY) over the span of 20 minutes. Not unduly disrupting the market. Both of these goals were botched. I think a better name for the Sell Algorithm would be “Bonehead Algorithm”, because the designer, and presumably the review team that vetted it did not consider what a sell of this magnitude could do to the market. The Sell Algorithm was designed to limit the number of contracts sold to 9% of the volume the minute before, however there was no provision for adjusting its strategy based on absolute volume, price fluctuations or time durations. I can imagine there were big fights about whether the percentage should be 8% or 10%, but 9% won out. It is widely reported that Waddell & Reed is the unnamed company in the report. 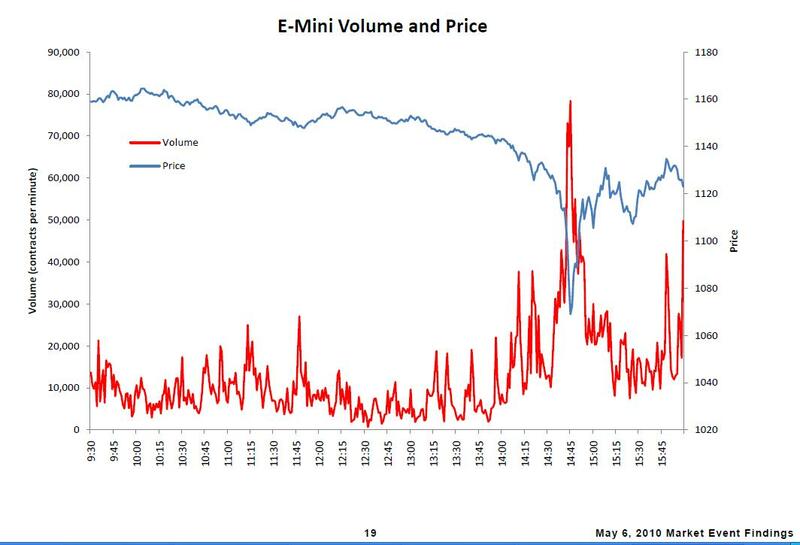 When they executed a similar trading move previously, they used a more nuanced algorithm that did factor in price, time and volume—it took about 5 hours to sell 75K contracts. For some reason, they ditched that approach in favor of this “improved” algorithm. Waddell and Reed didn’t anticipate that their selling strategy would set off a trading frenzy between the market makers (mostly high-frequency traders) in E-Mini S&P contracts. These traders primarily bought and sold between themselves during the initial disruption. The contract volume, which had been peaking at around 35K contracts per minute jumped into the 75K contract per minute range (see chart below). The clever Bonehead Algorithm responded to this jump in volume by upping the number of contracts it sold the next minute to 9% of the new volume number. This increasing selling pressured the E-Mini S&P market down more than 5% in less than 5 minutes. This sudden drop triggered the Chicago Mercantile Exchange Stop Logic Functionality, and trading was halted for 5 seconds. Five seconds isn’t a long time, but it was enough for the E-Mini S&P 500 market to right itself and start recovering. Unfortunately, the effects of this drop were already reverberating through the entire market. 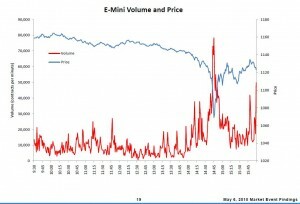 As the E-Mini S&P 500 futures were dropping firms that specialize in cross-market arbitrage took advantage of the gap between the E-Mini and equivalent markets (e.g. SPY, S&P 500 stocks) to lock in risk-free profits. For example they bought E-Mini contracts cheap and sold SPY until SPY’s price dropped to the equivalent level as the E-Mini. This process transmitted the E-Mini shock across all of the S&P 500 stocks—which comprise well over 50% of the total market capitalization of the US stock market. In response institutional buyers and sellers widened their spreads, switched to manual only trading, or withdrew from the market completely as they tried to understand the cause of this rapid decline. The remainder of the Flash Crash was like a major power blackout. As more and more market participants dropped off-line the remaining demand concentrated on fewer and fewer market makers. Trading on some equities collapsed. In those cases all that was left were the “stub quotes”—the never intended to be used bid / ask prices that market makers use to prevent a bid price of zero or an infinite ask price. These stub quotes were as low as $0.01 and as high as $100,000. Volume does not necessarily mean liquidity. High frequency traders can generate high volumes without providing true price support. Trading halts need to be coordinated across the entire market. Allowing some exchanges to stay on-line while others halt trading creates overloads that will likely result in disorderly pricing. For individual investors I think the primary lesson from the Flash Crash is to use “stop loss” limit orders very carefully. If they are placed too close to normal prices you will get sold out during normal fluctuations, if you set them too low you run the risk of being blown out at a lousy price by a market disruption. If you are going to use stop loss orders I think the best approach is to use a trailing stop approach, where the limit is automatically raised as the underlying goes up. If you use stop loss orders you should think twice before using the stop loss “market” order. These orders become market orders once the limit price is breached. If the market is disorderly you might get a fill that is well below your limit price. Instead you can use stop loss limit order. These specify a minimum price that you will sell at once the limit price is breached. If you set this number slightly below your stop loss price you will probably get a fill if the market is orderly, and it will offer some protection against being screwed by a disorderly market.